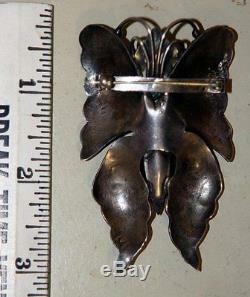 This is the nicest Dine' butterfly pin I have ever come across, that is why I bought it, I paid a fair amount for it too. It is made from cast sheets of silver (probably coin, but not tested)and is of significant age, 1940 or earlier, probably about 1930. Large 2 3/4" by 1 3/4", and beautifully made, great stamping, nice patina and just enough wear to show its age. Turquoise is nice too, small crack on the edge of one stone, but solid. Images are part of the description. Please see my other listings for more Native American jewelry, rings, earrings, pins, pendants, bracelets, etc. Artists include Mark Chee, Morris Robinson, Kenneth Begay, Austin Wilson, Bernard Dawahoya, Victor Coochwytewa, Dan Simplicio, Lewis Lomay, George Kee, and many more Hopi, Navajo (Dine'), Zuni and Pueblo smiths. 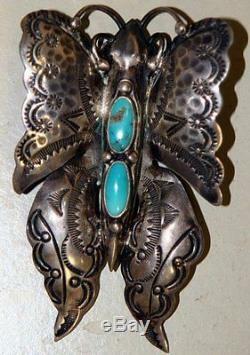 The item "Large Navajo hand hammered arts & crafts silver turquoise butterfly pin c 1930" is in sale since Tuesday, December 08, 2015. This item is in the category "Jewelry & Watches\Ethnic, Regional & Tribal\Native American\Pins, Brooches". The seller is "oceanica1" and is located in Omaha, Nebraska. This item can be shipped worldwide.